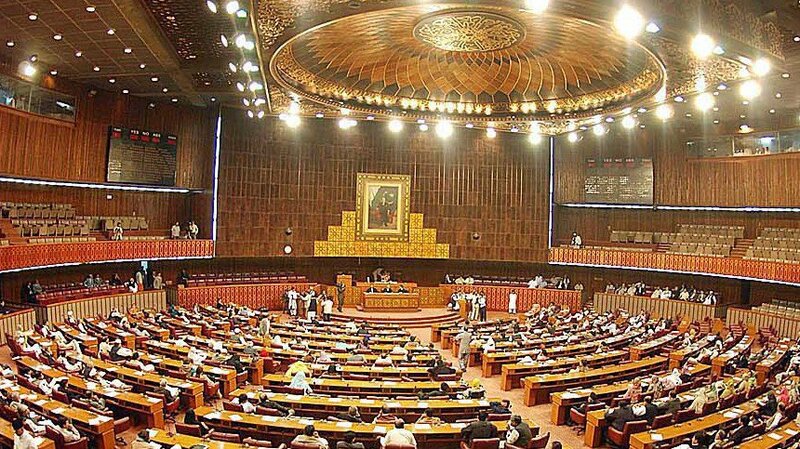 JNN 10 Apr 2015 ISLAMABAD — Pakistani parliament on Friday unanimously adopted a resolution, calling upon the United Nations and Organization of Islamic Cooperation to stop war in Yemen. The parliament session was convened this week to seek proposals from the lawmakers on how to respond to the situation arising out after the Saudi-led Aggression in shape of airstrikes against the Shiite Houthi group in Yemen . The lawmakers during the five-day debate opposed participation in the conflict but vowed Defend the Sanctity of the Holy sites in Saudi Arabia , and also to support Saudi Arabia if its sovereignty and territorial integrity is threatened . Finance Minister Ishaq Dar presented the resolution which said Pakistan is impartial in the conflict but will stand with Saudi Arabia if its sovereignty is threatened. “Pakistan is seriously concerned at the deteriorating situation in Yemen as the crisis could destabilize the region,” the resolution said. Prime Minister Nawaz Sharif also attended the session who in his early statement in the house said Saudi Arabia has sought Pakistani fighter aircraft, warships and ground troops. The resolution said Pakistan supports international and regional efforts for the peaceful solution to the crisis in Yemen. “All sides to the conflicts in Yemen should peacefully resolve the issue,” the resolution said, and called for assistance and rehabilitation of the affected people in Yemen. The lawmakers praised the government for convening the special session of the parliament to hold debate on the conflict. Speaker national assembly earlier urged the members of parliament to evolve consensus among all political parties on the draft-resolution on Yemen crisis. The treasury and the opposition benches agreed on a draft of the resolution that also urged Pakistan to continue its diplomatic efforts for a peaceful solution to the conflict. Prime Minister Nawaz Sharif recently visited Turkey for talks on the Yemen war and both sides called for solution to the conflict through diplomatic channels. Iranian Foreign Minister Javad Zarif concluded his two-day visit to Pakistan on Thursday in which he Met the Prime Minister and the Army Chief , in which he called for halt to airstrikes, intra-Yemeni dialogue and formation of a broad-based government in Yemen. This entry was posted in Iran News, Middle East, Pakistan News and tagged iran, Jawad Zarif, Saudi Arabia, Saudi Yemen War, shiite Houthis, Turkey, Yemen. Bookmark the permalink.